I suppose people play all kinds of different ways at Ambrella during development. Someone finds a way to always win. If you reveal it, it gets crushed. Did members of Mario Club7 also find such surefire strategies? 7Mario Club Co., Ltd.: It conducts debugging and testing on Nintendo software during development. If we think that’s too much of an advantage, we crush it, but if we think, “Well done for figuring that out!” then we’re more, “Go ahead and use it!” and leave it in. You never know what winning strategies are hidden in the game, so I hope that players will work hard to find them. There’s an enormous amount of combinations, so I’m sure you can find fun ones that haven’t been discovered yet. And this time, I worked for a long time with the debuggers, and there was something that made me really happy as a game developer. Oh, I heard about that - that the debuggers really liked it. What do you think they liked so much? Perhaps one reason is that they sensed what I just mentioned, that there are still a lot of fun combinations to be found. I think another reason may be that they wanted to actually experience using the StreetPass8 feature out on the street. 8StreetPass: A feature that allows users who enable it to walk around with their Nintendo 3DS system turned on to exchange game data with other Nintendo 3DS users that they pass on the street. The Nintendo 3DS system can exchange data for up to 12 games even if the Game Cards are not inserted. I see. Debuggers can experience StreetPass, but only within the limited space of the company. That’s right. As mentioned in the session of “Iwata Asks” over Pokédex 3D9, we emphasised the SpotPass10 feature in that game, but unfortunately we couldn’t implement StreetPass. 9Pokédex 3D: Software available for free download for the Nintendo 3DS system via the Nintendo eShop application since June 2011. 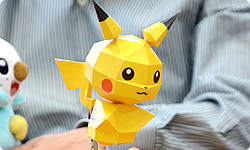 It allows players to view the new Pokémon that appear in the and games from whichever angle they like in 3D. The software also allows users to use Pokémon AR Markers to take photographs with Pokémon. This Iwata Asks interview will be available soon for European readers. 10SpotPass: A feature in the Nintendo 3DS system that, when activated, receives various information and content just by being near a wireless LAN access point. With Pokédex 3D, each set of data is too big, so you couldn’t quickly send it via StreetPass. That’s right. So with Super Pokémon Rumble, we wanted to create a kind of gameplay that would link people together through StreetPass. We put a lot of detailed effort into the StreetPass elements of gameplay, including the general atmosphere and allowing players to view each other’s Mii characters. How did using Mii characters come about? At first, we didn’t think about the Mii characters. At first, we had a relatively closed world in mind, but Ishihara-san, with perfect timing, suggested an idea to us. Why did you accept so readily? I think because what he suggested felt like something that might really exist. Mii characters gathering in a toy store, communicating, and enjoying battles is like a real-world gathering. We decided to make a place for the Mii characters to meet, where they could exchange messages with people they had encountered, fight, and benefit from winning. We wondered if you could really make those Toy Pokémon and made this. We decided to make this an early purchase incentive11 for Super Pokémon Rumble. 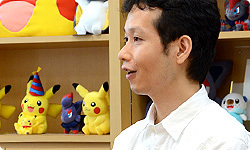 11The incentive for early purchases of Super Pokémon Rumble was only available in Japan. 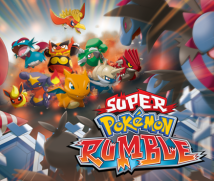 Please see the official site for Super Pokémon Rumble for details on pre-order bonuses for your region. Wow! Do early purchasers get this as an incentive? The customers put it together themselves. Yes. As I mentioned in our session of “Iwata Asks” over Pokédex 3D, another early purchase incentive is a collection of the Pokémon AR Markers, so I hope people will line up the Pokémon AR Markers and papercraft and take pictures of them with Pokédex 3D. I see. Now I’d like to hear you each recommend something to people who know the previous Pokémon Rumble and to people who don’t. Ozawa-san? Oh, starting with me? Okay. Well, I’m sure even people who don’t know the previous game can play it, so I hope they’ll pick it up. When you say that you’re sure they can play it, you mean that they can play it regardless of their skill at action games or how much they know about Pokémon. That’s right. The game is such that even people who have never played video games before can enjoy it. You’ve prepared a game that continues to deepen the more you know. It’s simple, so you don’t grow tired of it quickly. What do you recommend to people who do know Pokémon Rumble? So please, play this one, too! You mean that people who played Pokémon Rumble on Wii will find playing this one to be incredibly fun as well. It’s fun. Yes, I think so. You’ve beefed it up all over the place. You’ve beefed up places where people will be looking for it as well as some unexpected places? Yes, that’s right. Like that. Thank you. (whispering) Ozawa-san isn’t very good at talking.